[SatNews] A pair of hard-working SSTL satellites, Deimos-1 and UK-DMC2, have just completed five years in orbit. 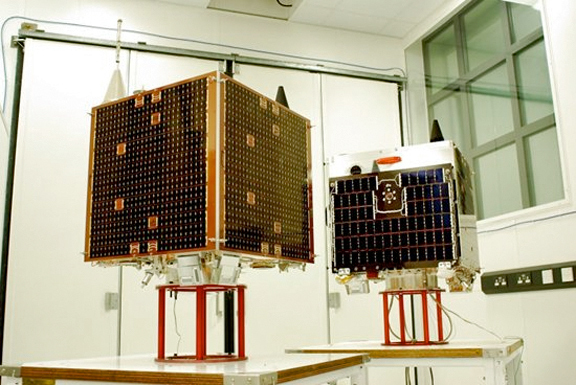 Pictured are the Deimos-1 satellite on the left, and UK-DMC2 satellite on the right. The satellites are both Earth Observation (EO) missions based on the SSTL-100 platform and were launched together on board a DNEPR rocket from the Baikonur Cosmodrome in Kazakhstan on July 29, 2009. The calculation is that these satellites have each completed more than 26,000 battery charge/discharge cycles and orbits, and have travelled a total distance of four times around the Sun and back, during which time they have together imaged the total landmass on Earth 30 times over. 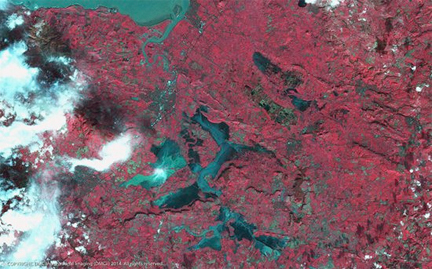 They are extremely productive for their respective operators, providing billions of square kilometers of image data for a variety of applications here on Earth such as agricultural, resource, and disaster monitoring. Botany Bay, south of Sydney, Australia. Photo courtesy of Elecnor Deimos 2014. Deimos-1 was manufactured for Spanish customer, Elecnor Deimos, a commercial imaging organisation based in Valladolid. 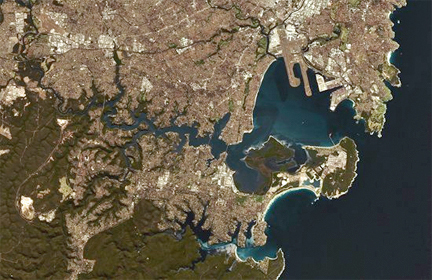 The satellite flies SSTL’s DMC imager, providing red, green and near infrared bands with a high spatial resolution of 20m and a 625km wide field of view. The data processing and storage system on board the satellite allows the satellite to obtain near real-time data, with a high capacity for repeated imaging—equivalent to full coverage of Spain and Portugal every week, and bi-weekly coverage of the whole of Europe. Deimos-1 has contributed to some major campaigns, including the coverage of Africa in 2009-2010 and in 2011-2012 for the European EO program Copernicus, crop monitoring in Europe for JRC's Monitoring Agricultural ResourceS (MARS) unit, and the continuous coverage of Spain for the Spanish National Remote Sensing (PNT) programme. Flooding around Bridgwater, Somerset, UK. Photo credit: UK-DMC2 image @ DMCii2014. Together, and working as a constellation, Deimos-1 and UK-DMC2 have a unique capacity to provide frequent coverage of large areas, which has allowed them to carry out successfully some major campaigns, including the monitoring of the crop season in the US for the US Department of Agriculture (USDA) for four years in a row, since 2011, and the constant monitoring of French and UK crop fields for precision agriculture applications with various public and private customers. UK-DMC2 provides imaging subsidiary, DMCii, with 22m GSD images, with a 600km swath width. The spacecraft operates in two modes, a near real- time imaging and downlink mode allows imagery acquired within a ~2000km radius of a ground station to be downlinked during the same pass, and secondly, a broadcast downlink mode that enables DMCii’s customers to receive data directly from the satellite via their own ground station. UK-DMC2 recently provided images of flooding in the UK to emergency responders during the winter storms of 2013/2014. The satellite has also been used in a campaign with the Algerian Space Agency, ASAL, to forecast and track locust plagues in Algeria, to detect deforestation for the Brazilian government, and to monitor wildfires around the world, including devastating bush fires in Australia earlier this year. DMCii expects to be operating UK-DMC2 until at least 2018.